This is something about remote Desktop, Gonna talk about how to control your PC remotely with a cool freeware. Considering the internet we can download too many free tools by which you can control and manage your Personal Computer Remotely. Choosing a good tool is important and difficult as far as performance and the security of your PC. Well, Let me introduce you a wonderful software which is used for controlling your PC remotely. ‘The Online VNC’. It is one of the best in performance and user interface. 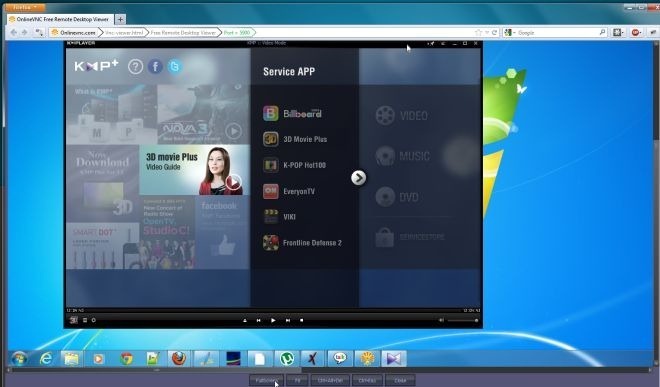 The major difference between other tools and The Online VNC is that, it uses a standard web browser client space to manage all the activities. The service offers you an ultimate speed experience with the software and you won’t be feeling that you are controlling the PC remotely instead you will get a ‘home’ computer experience. That’s sounds great, because if you have a good internet connection and Online VNC literally you can do anything with your remote PC. How does Online VNC help you ?? That’s a necessary question to ask. As you know this software is meant for rt emote controlling distant PC’s via internet. The user will be able to use his desktop and almost all of it’s functions remotely via internet. you will be able to do it after installing online VNC with some clicks via your web browser without any complications of networking or programming. The software seems to be periodically updating in nature. Each new version comes with new updates, modifications and cool new features. This time also it has cool updates and modification. most important factor is the compatibility with Windows 8 OS. Download it …it’s freeeee.